My new BFF Poh thinks I’m hilarious, as you can see here in this photo I had nothing to do with. SunRice asked me to chat with Poh and put this post together. I hope they call back with more tasty ideas. I’m all for dishes where you get to exchange minimal effort for maximum flavour and satisfaction. Bacon and eggs. Tuna bake. Cheese toasties. 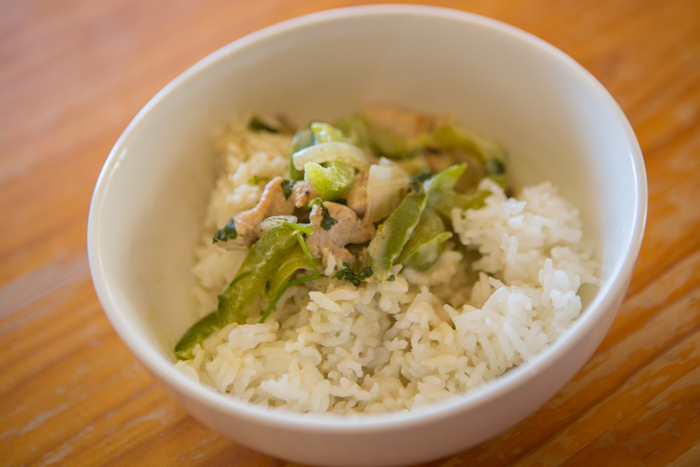 And Green Chicken Curry, which you might mistakenly think takes an hour and several Tafe courses to produce properly. This recipe actually takes so little time (it’s only 5 steps and 9 ingredients), and is such a lovely day out for your taste buds and your belly, I always spend half the time shovelling it into my mouth wondering why I’ve waited so long to whip it up again. It’s also the perfect winter warmer. Preparation is the key here. Put your rice on, prep the rest of the ingredients then light your stove. The cooking of the curry itself only takes five minutes. Because Poh Ling Yeow is the SunRice ambassador (as well as host of SBS’ ‘Poh & Co.’ and runner up of Masterchef season 1), and SunRice as sponsoring a couple of posts on my blog, I had the chance to chat with her a bit recently. I went a bit fangirl on her, but she pretended not to notice because she’s wonderful. Or she was ignoring me and focusing on the other five people online. One of those for sure. So anyway, I got to ask Poh what she thought were the biggest mistakes people made when cooking rice. She knows her stuff. Also, I’ve been doing it wrong. All of it. 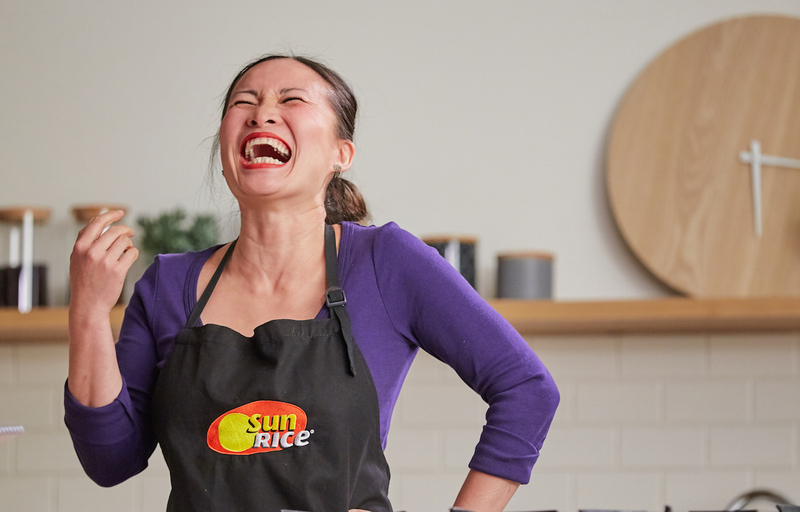 Which is sort of great anyway, because now I can genuinely say ‘Poh taught me this’ when I serve up my superior rice. My mouth is watering looking at this photo. I have a serious theory green curry paste is addictive. STEP ONE. Cook SunRice Jasmine Rice as per pack instructions (simmer for 15 minutes or until soft and cooked). STEP TWO. Saute the onion and chicken in a hot pan or wok for 2 minutes, until browned. STEP THREE. 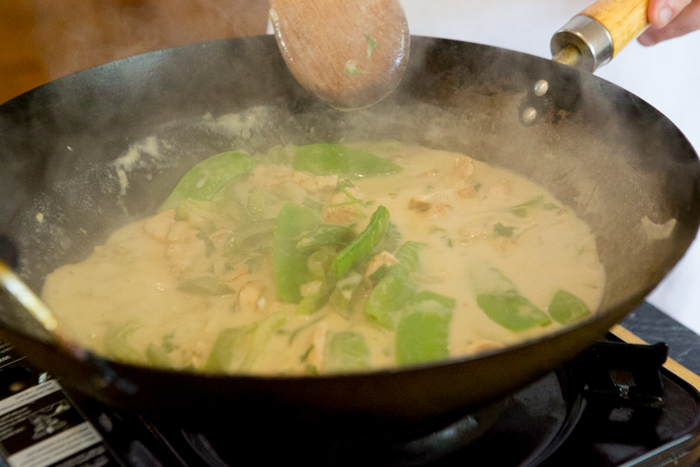 Add the capsicum, green curry paste, coconut milk and stock, and chase it all around the pan for two minutes. STEP FOUR. Add the snow peas and coriander and cook for another one minute. STEP FIVE. Once cooked rice has sat idle for five minutes, loosen the grains with a fork so it’s wonderfully fluffy – Poh taught me that. Previous articleAverage Parents Unite ! That was awesome! The only error I can think of is, coconut milk comes in tins not jars?!!! 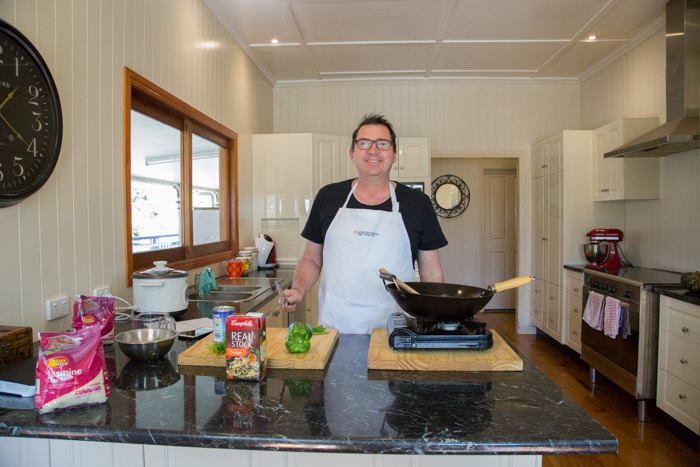 … We need more cooking videos please!!! Yep. Was kicking myself in edit. Ooer, 1⅓ WHAT? Cups? Buckets? Truckloads?! Haha! Did you spot the disappearing/reappearing wok? Great recipe but not every mum has a husband to warm their feet – don’t forget the single mums ( and dads) are families too! It seems very easy, is the Thai curry paste spicy hot? I enjoyed the presentation, this is the first time I see you cooking, are there 2 of you for real?